Hot-in-place is a form of hot asphalt recycling that is not commonly used. It is an on-method, on-form and on-site method of rehabilitating and repairing bituminous pavements thus minimizing the use of material. This process effectively restores rather than sink the damaged pavements into the soil. Three basic processes are involved in the Hot-in-place process. All these three processes require the use of a continuous train like a specialized plant. FHWA, 2001c is a commonly used plant in this reconstruction process. The first Hot-in-place process is heater scarification where a plant that heats and scarifies the pavement is used. This plant adds a rejuvenating agent which improves the recycled asphalt binder, mixes and then levels the mixed asphalt. The asphalt is then compacted using a compaction machine. However, this process cannot be used to prepare severely damaged pavements. The second HIP is the repaving method. In this approach, the top25-50mm of the existing pavement is removed, and a rejuvenating agent then added to improve the viscosity of the asphalt binder. Recycled material is used as a leveling course by a primary creed then a thin HMA overlay is put. The pavement is finally compacted. 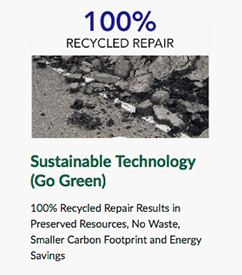 Remixing is the other Hot-in-place process of recycling pavements. This method is only used when an additional aggregate is to be done on the pavement to improve either its stability or strength. Remixing is similar to the process of repaving except that a new virgin aggregate is added to the recycling material before it is leveled. Hot-in-place can only be applied in some specific situations and not all. For a favorable Hot-in-place, four conditions must be met. The first condition is that the existing asphalt binder air void must be high enough if it is to accept the required amount of rejuvenator. Secondly, this process can only recycle shallow surfaces of 50mm or less. Thirdly, even pavements with a depth of 50mm cannot be addressed by this method if their layers are not binding together. Finally, heavily patched, rutted or chipped will not likely be handled by this recycling process. 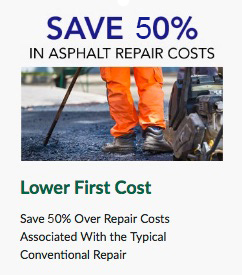 The purpose of HIR is to correct shallow pavement distress. Asphalt binder rejuvenating agent is the commonly used material together with new aggregate. 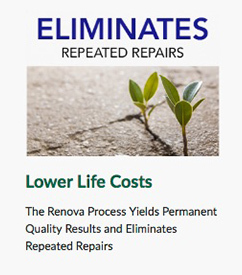 To save on cost, cores from the existing pavement are used to determine the amount of rejuvenating agents to be used.